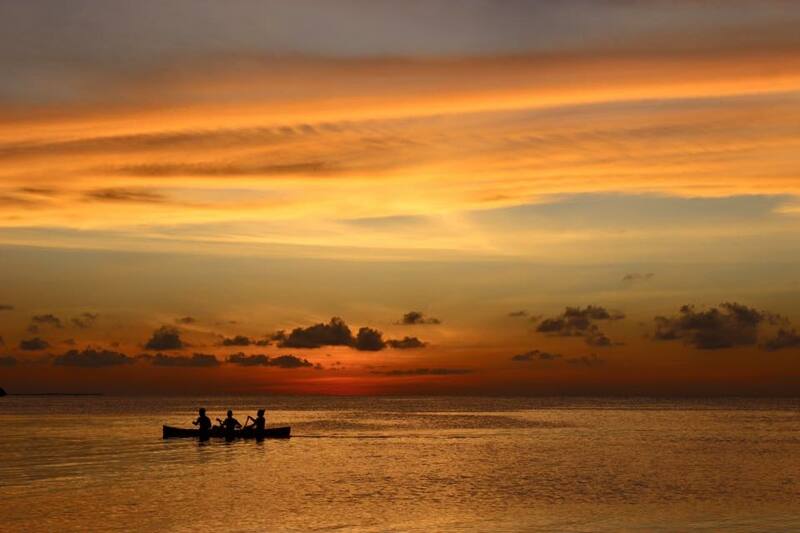 Paradise In Caye Caulker? You Better Belize It! What else could I say about Caye Caulker, the little Caribbean island off the coast off Belize, except that it is simply perfect. 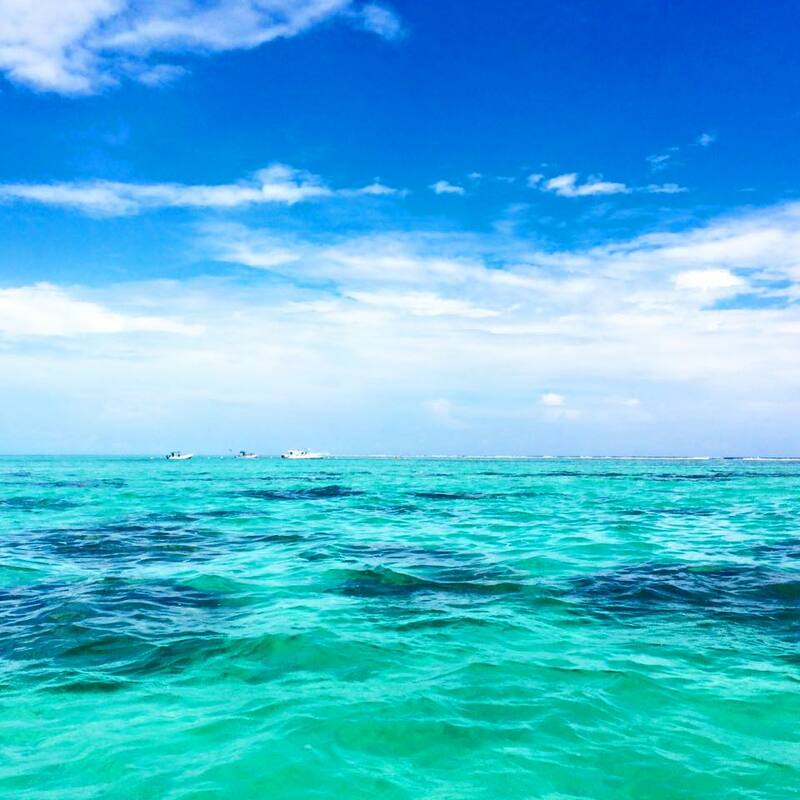 If you like the idea of sunshine, crystal clear ocean, eating lobster for breakfast, lunch and dinner, sipping cocktails at beach bars, friendly locals and snorkeling in the second largest reef in the world then chances are you’d think Belize is pretty perfect too! Bonus: It’s cheap! I love this place so much my two day trip got extended to five, I just couldn’t say goodbye to this paradise! 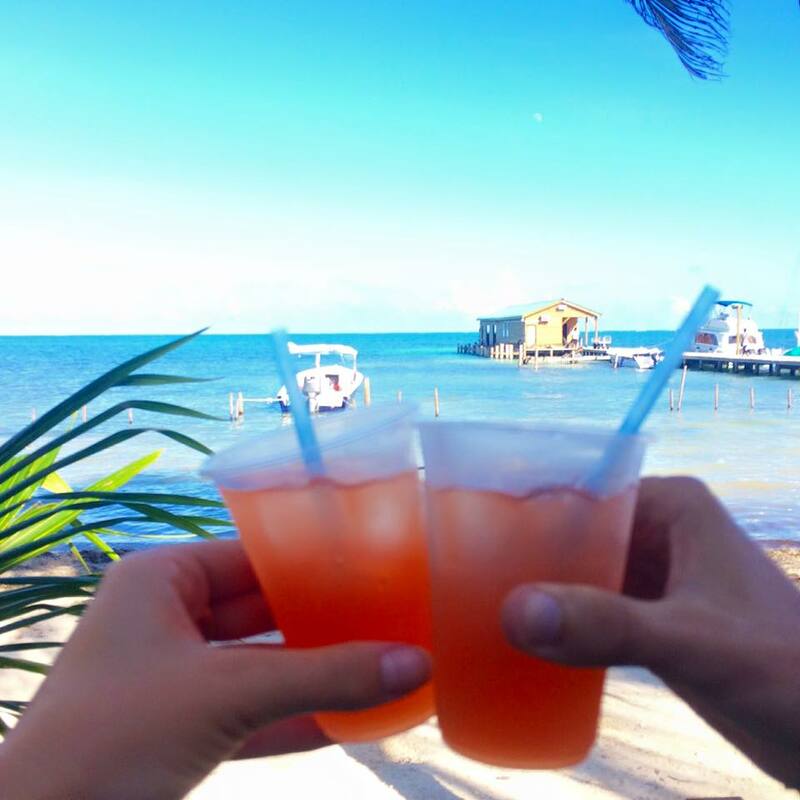 EVERYTHING YOU NEED TO KNOW ABOUT CAYE CAULKER! The Belize Barrier Reef, a UNESCO site, is the worlds second largest reef after Australia’s Great Barrier Reef. Snorkeling and Scuba Diving is the main thing to do during your time here. A half day tour will set you back around $60 Belize Dollars whilst a full day around $110 Belize Dollars. We did the half day tour for a few reasons, one we were running out of money and two the manatees hadn’t been seen in a while which was a big selling point of the full day for us. We also snorkel pretty regularly, and have snorkeled with Turtles before, so didn’t feel like we’d be missing out on too much. We still enjoyed some of the best snorkeling I have experienced in my life. 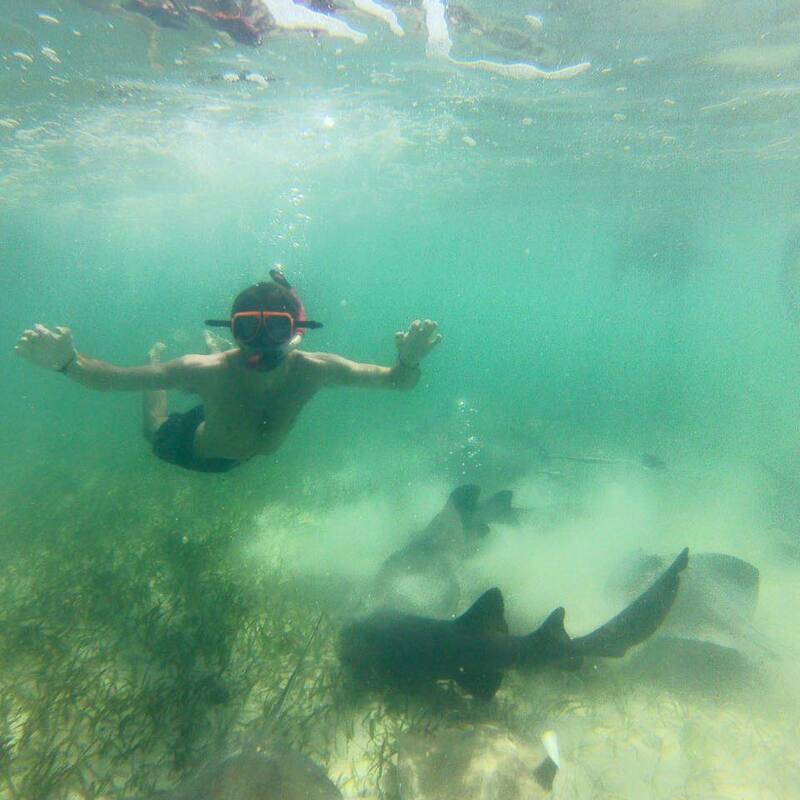 We snorkeled the Channel, Shark Ray Alley & the Coral Gardens. We arrived in Caye Caulker on there seventh straight day of rain. Luckily for us we woke up to blue skies and sunshine. Due to the tropical storm the locals said the water was very murky and the visibility low. If that’s the case I’d love to see it after a week of sunshine as we thought it was incredible. The coral was bright, the fish abundant and the water crystal clear. You’d be crazy to visit Caye Caulker and not snorkel this incredible reef system! If we could afford it I would have loved to fly over the Blue Hole too, or better yet, dive it! The most popular hostel on the island is ‘Dirty McNastys,’ which will cost you around $25 Belizean Dollars a night. If you want to party this is definitely the place to stay. As the name suggests it’s not the nicest place you’ll ever stay, but you’ll have fun! We did not pre-book accommodation as all of the places online that were in our price range looked dingy. When we arrived a Rasta man called Gilbert was waiting at the dock with a booklet of available accommodation. We ended up following him to a hotel right on the beach called ‘Tropical Paradise Hotel,’ (which is called ‘Paradise Too’ on booking.com… I don’t know why). As it was off-season we scored a private room there with beach views for only $1 extra per night then what it would have cost us for two dorm beds at the hostel above. We also booked our tours through the hotel, who will give you a 10% discount if you’re staying with them. If you are traveling as a large group you’d be wise to look up rentals on ‘airbnb’ etc. You can rent out whole houses for reasonable prices. Note that prices vary greatly depending on the time of year you visit. The busy season is from December to April. 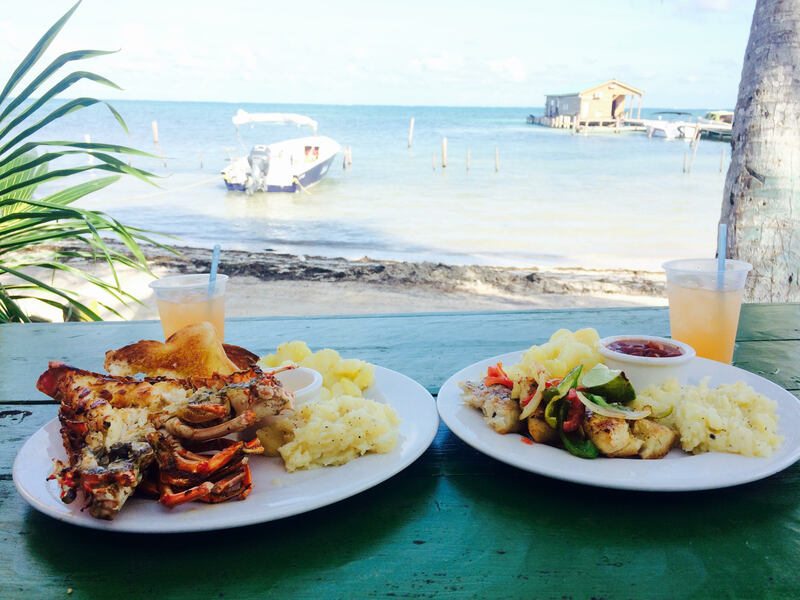 If your idea of heaven is eating fresh, delicious seafood for breakfast, lunch and dinner than Caye Caulker will be your heaven. You can score a whole, fresh lobster or fish for just a few dollars. It’s amazing. Caye Caulker ruined me for life. How am I supposed to live a life now without eating Lobster for breakfast, lunch and dinner?! We lived like Kings in Caye Caulker and will now be eating like peasants again! Street Food – If you walk down the beach you will see a line of people with barbeques cooking up fresh seafood. You can normally score a whole Lobster with Coleslaw, Rice and Salad for $20 Belizean Dollars. They will normally let you choose your lobster from the bucket of live lobsters which will still be moving. It doesn’t get much fresher than that! La Cubana – We ate here for lunch one day and we loved it. The restaurant is right on the beach, which was beautiful. We had the Red Snapper Fish (which was cooked perfectly), with mash potatoes, roasted potatoes, coleslaw, three rum and punch drinks and a cake for $15 Belizean dollars. Amazing value! We also ate the Lobster there and again, delicious! Belizean Flava – If the owner doesn’t convince you to eat here from his charisma then the smells coming from there barbeque sure will. We ate the Jerk Chicken and the Lemon, Garlic Lobster and it was delicious! The chicken was $15 Belizean Dollars & the Lobster $25. Both came with two sides, two Rum & Punch drinks and a Cake for dessert. It was finger lickin’ good! Roy’s Blue Water Grill We had a Lobster here one night, which was served with delicious garlic-butter roast potatoes and coleslaw for $25 Belizean Dollars. There are many cafes around where you can enjoy breakfast but if you were on a budget like us we would buy a loaf of bread for $2 Belizean Dollars (we always carry a jar of Peanut Butter with us for things like this). If you can still fit in dessert after all that Lobster eating be sure to check out ‘The Cake Lady,’ who sets up a stand each night and sells her famous Banana Bread, Chocolate/Coconut Pie and whatever else she’s created that day. They are delicious! But don’t be fooled by all the copycats/fakes trying to take a piece of that pie… (see what I did there?). 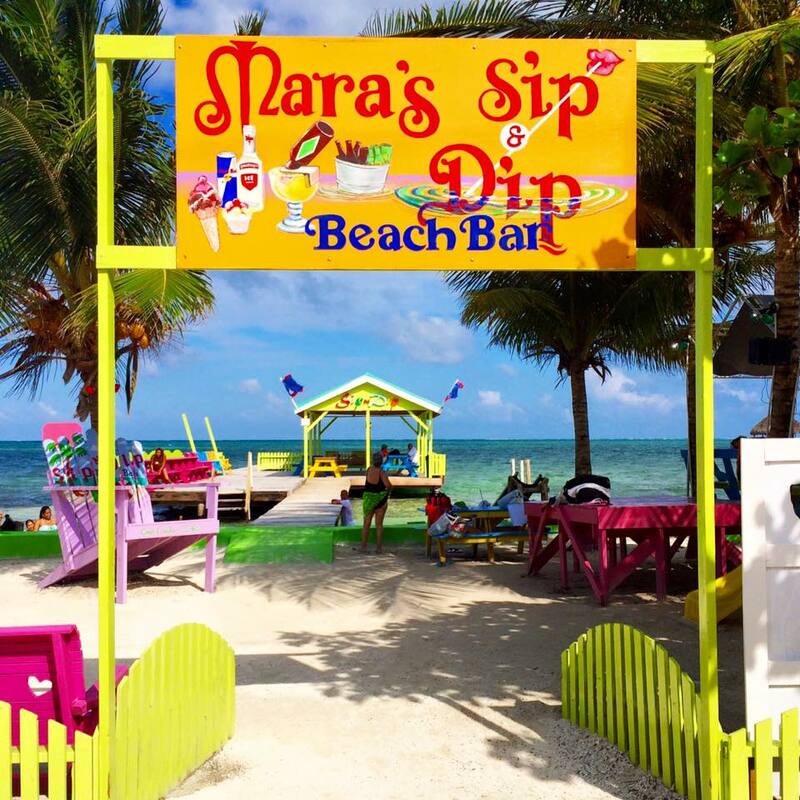 Drinking is a big past time in Caye Caulker with Beach Bars all over the island. The most popular ones during my visit being ‘The Split’ & ‘Mamas Sip & Dip.’ The music was pumping, the drinks over-flowing and the happiness on high! The great thing about these bars were they weren’t just for the young, backpackers on the island. The crowd was mixed in ages and it kind of worked better because of it. Everyone dancing and chatting together like old friends. Whilst you can get a bottle of Rum in the supermarket for only a few dollars (the drink of choice in Belize), I found these bars to be a bit pricey at $15 Belizian Dollars for a cocktail, so if drinking is high on your agenda be prepared and come with enough money! Even though the ‘roads’ in Caye Caulker are made from sand there isn’t an actual beach perse, but rather docks and jettys where people spend there days soaking in the sun. The docks near the bars are the busiest but if you want a bit of serenity and quiet take a walk down the beach where you’ll be sure to find yourself a private dock to spend your day! The water taxi departs the terminal in Belize City almost every hour between 8am and 5pm. One way will cost you $30 Belize Dollars and an open-ended return ticket will cost you $50 Belizean Dollars. You’ll need to arrive about thirty minutes before departure. The ride to the island will take about 45 minutes. The best place to watch the sunset is from outside the ‘Iguana Reef Hotel,’ where they have a beautiful deck and chairs with undisrupted views of the sea. For sunrise I would go to the private dock of our hotel ‘Tropical Paradise,’ but any of the many docks on the east side of the island will suffice. Despite the rumours, there are ATMS on the island so don’t stress about getting money in Belize City before your boat (the city is notoriously sketchy). A lot of places also accept Credit Cards/Debit Cards. As well as the local currency they will also accept US Dollars (which is handy to have on you at all times whilst traveling Central America for emergencies, but please don’t be one of those people who refuses to use local currencies. Not only will you lose money from it but it’s a bit arrogant). They also speak English in Belize!! It’s so strange to get used to after months of speaking Spanish. I would constantly find myself replying in Spanish, even though they’d asked me a question in English. But it’s awesome! Caye Caulker was one of our highlights in Central America for sure! Such a beautiful place with friendly locals and delicious food. I would visit again in a heartbeat! 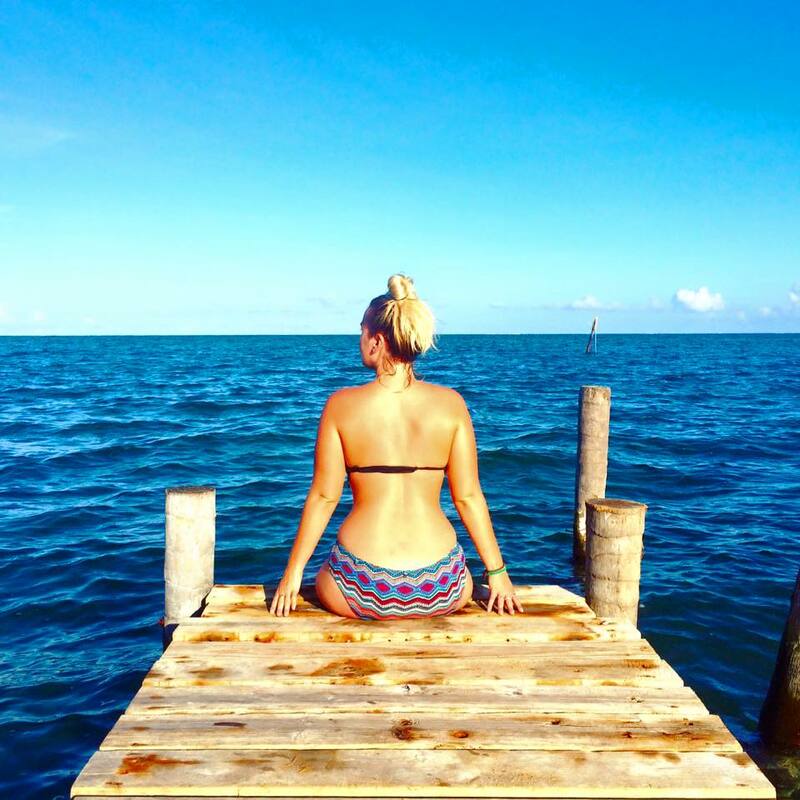 If you are planning on visiting Caye Caulker I hope this post helps you plan an epic trip. Right you are, the photos don’t do it justice at all. Thanks for reading! I miss living in the Caribbean. I lived in Puerto Rico and it was awesome. This is great for when I head to Belize though! Oh I would LOVE to visit Puerto Rico! Belize is one of my favorite places in the world. I’ve been to Ambergris Caye several times, but haven’t ventured out to Caye Caulker yet. Love your photos, it’s now on my list for when I go back! Oh definitely. I wish I had visited Ambergris Caye also. YESSS So glad I read this post! We’ll be in Ambergris Caye for a week over the Christmas holidays and I can’t wait to pig out on fresh seafood! A whole lobster for just a few bucks? Jeez…. That sounds like heaven to me. Oh you are going to LOVE it there! Dirty McNasty’s! – what a great name! my friend is moving to Belize in January so if we ever get to visit this place is going on my list! So glad you found this helpful, it is a fun name. Thanks for reading! Lobster for cheap?! I’m half excited and half scared because it is cheap haha. However, I feel like I’d totally risk it since it sounds fresh and delicious! Oh no risk at all, they are so fresh they are still alive when you buy! I have been to Belize but not that part of it. Great places to see , do and eat at. Great details. Look at that water!! I am such a sucker for clear blue water. Need to add this to my list for sure, it looks beautiful! Great photos! As am I, it sure is a beauty! What an amazing Island, looks so beautiful! That looks like a wonderfully relaxing way to spend a few days. The water looks so perfect! Is the reef seeing similar issues as the Great Barrier Reef? I think it isn’t far away from The Great Barrier Reef, as it is all connected to global warming after all, but I think it still has a few years left!